I have been trying the new LG GW620 Android Smartphone. It’s a neat touch-screen device, runs Android 1.5 “cupcake”, and has a slide-out keyboard. There are plenty of good things about this phone, not least its relatively modest price. I see it on offer for around £270 unlocked. 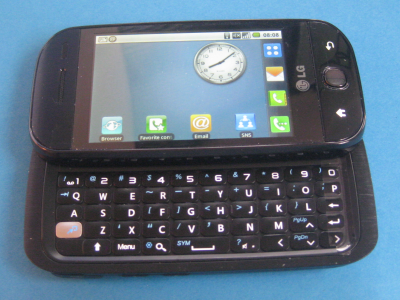 It is well specified: Quad-band, HSDPA, 5 megapixel camera, GPS, microSD slot, and even an FM radio. Application availability is excellent, thanks to Android market. I can’t quibble with the value for money. Google Maps on this thing is brilliant. It picks up your location automatically and can give you step-by-step or turn-by-turn directions to your destination. All very nice; but I also found it fairly annoying. The worst thing about the phone is the scrolling. You go to a web site, and start reading. You reach the bottom of the screen and need to scroll. A sweep of the finger, and the page flashes past way beyond where you want to be. A little mini-sweep and it does not move at all. Maybe with enough practice you can do it; but I found it easier to slide out the keyboard and use the arrow keys – missing the point of having a touch phone. Other touch annoyances are that you can easily hit a hyperlink or pop out a menu by mistake, or nudge the back or home key at the bottom of the phone by mistake, taking you away from where you want to be. I also found usability lacking when it came to setting up the phone. Email was particularly confusing. There are no less than four email applications on this device: Email, My Email, Moxier Mail and Google Mail. I worked out that Email is good for POP3 and IMAP; My Email is good for Yahoo, apparently; Moxier for Exchange, and the last is self-explanatory. It is not particularly obvious which is which when you first pick up the device. Another issue is finding the menus. There are settings in all sorts of places. Add a widget to the home screen by pressing and holding on a blank area, or clicking Menu on the keyboard. Remove it by pressing and holding on the widget, and dragging to the arrow icon, which changes to a waste bin icon. Find settings by pressing Menu on the home screen, then click Settings; or by pressing the arrow icon, then scrolling through to the Settings applet. There is a choice of home screens on the device: Android, or LG. I tried both, but in the end went back to Android as the easiest to use. Battery life is poor, and I wouldn’t count on getting through an entire day if you make heavy use of web browsing, camera and multimedia. Perhaps because of this, the screen is set to lock after about 20 seconds if you do not perform any actions, and unlocking requires first pressing the Menu key, then pressing and holding the screen – a tedious sequence. While I’m griping, it’s a shame that the GW620 is Android 1.5 rather than 2.0, something which apparently is unlikely to change, at least officially. Some great work is in progress to get Android 2.0 working unofficially though. Despite these issues, the GW620 does have merit. The camera is great; I was impressed by the quality and features, including flash, face recognition, and geotagging. The web browser is decent. Once I’d figured out the various mail applets, I got both Exchange and GMail working without any issues. Considering the strong features and the large number of available apps, this is a capable device and good value. 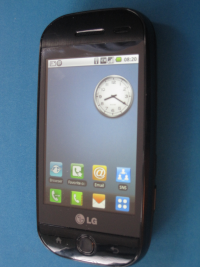 When I reviewed the LG Viewty, I concluded that it was a good effort spoilt by lack of polish. Of course that last 5% of usability and quality is the hardest to achieve, but makes a big difference. This one is miles better than a Viewty, thanks partly to Android and Google services between them, but still leaves me thinking that it needs a little more work to shine. I have upgraded to new mobile phones every year, but this is the first time I have ever been excited by the features on a phone for the amount I part with every month. I have kept a palm top for my organiser and its only now that I have a phone which presents information the way a palm top did, thanks to the LG Gw620 I have gotten rid of my PDA. My bigest challenge has been to set up my Yahoo e-mail account as my user name or password is said to be incorrect. Tried getting help from T-mobile services but no good.Battery life is no good as I charge the phone every night, though that might also be because I now spend a lot of time on the defferent applications of the phone. The home botton is absolutely annoying and touch sceen is no good, I always use the querty keyboard. For a good phone as this one I think the outer casing should have been silver all round. I just wanted to point out that the issue with hitting hyperlinks and such is easy to avoid as the screen doesn’t recognise that you’ve hit the link until you actually lift your finger off the screen. This means that you can just hold your finger down for a second before you scroll. I found this extremely useful when I figured it out. Also, holding down the unlock key is NOT the only way to unlock the screen. If you read it carefully, it says “<<press and hold to unlock"
So you can actually press the middle key, the menu key on the keyboard, or even press the 'on/off' button. All of these unlocking techniques work, which means that unlocking the screen can be extremely quick and easy. I love my GW620, and I think it is GREAT value for money. Still, if you know how I could upgrade it, officially or not, i don't really care, then could you please let me know how?? I love android, but not having the bluetooth file transfer is seriously annoying. And the only way I can find to get it is from the android market. It works, but not nearly as well as I want it to. The app itself wants it to be on android 2.0 or higher… and to be honest, so do I.